Advocates and opponents of gun control held dueling demonstrations at the Virginia Capitol on Monday as the perennial debate over the hot-button topic began anew. Democratic Gov. Terry McAuliffe is pushing a package of gun control measures ahead of this fall's state legislative elections even though they stand little chance of passage in the Republican-controlled General Assembly. In the afternoon, gun-control backers wore yellow ``Background Checks Save Lives'' stickers and displayed a string of red paper hearts representing the more than 800 gun deaths in Virginia last year. Among the speakers was Democratic Attorney General Mark Herring. 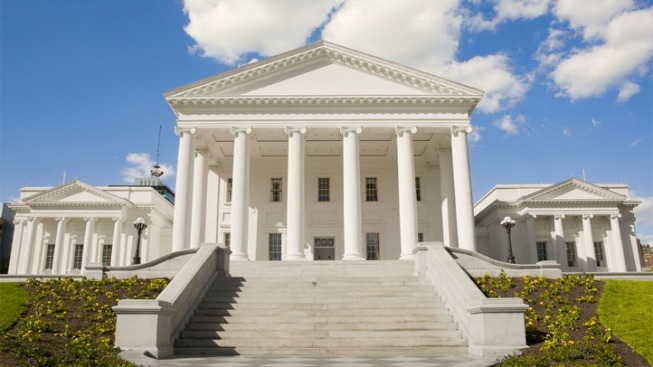 McAuliffe has proposed restoring a Virginia law, repealed in 2012, limiting handgun purchases to one a month; closing the so-called ``gun show loophole'' that allows sales by private sellers without a criminal background check; prohibiting possession of firearms by people convicted of misdemeanor domestic violence and those subject to protective orders; and revoking concealed handgun permits of parents delinquent on child support payments. Meanwhile, Republican lawmakers have introduced a variety of gun-rights measures, including bills that would allow concealed-handgun permit holders to carry their guns on school property outside normal school hours; prohibit colleges and universities from restricting the carrying of concealed handguns on campus; allow handguns in unsecured areas of airport terminals; and allow lifetime concealed handgun permits. Under current law, permits must be renewed every five years.